I was introduced to the concept and importance of "opening action" in a class with Gary Frost at PBI this year. I had never thought much about it before, but it made me very happy to learn about it and to learn why it is good and how it happens and all that good stuff. It also answers some questions that I've been asking myself. The questions I've been asking myself are primarily concerned with exposed spine bindings like the chain stitch binding and some other similar sewings where the spine of the book is so often left unlined, but which historically would have been lined. I have made some of these chain stitch bindings (popularly termed "coptic") because they seemed to be very common and I thought I should keep up with the Joneses, so to speak. I was never happy with how the covers were just sewn on and just laid there, dead. I wondered if this was really alright, and how durable it would be, and wondered if I was missing something. It is dead because it has no relationship with the rest of the book; as if the cover and the book are entirely separate objects. In my class with Gary Frost, he talked at length about the "opening action" of books: the opening of the cover should facilitate the opening of the book. The cover and the text block should function together. In this class we made a book that demonstrated the opening action really well so I am beginning to understand what is happening. Achieving the opening action just requires a few extra steps and ultimately a covered spine. I prefer a covered spine anyway. The whole point of a book's covering is to protect the textblock, and an exposed spine isn't very well protected, is it? For those of you who are now thinking, "oh no! the book won't open flat anymore," do not worry, it will still lie flat. I made a couple of these chain stitch bindings with opening-action-improvements; however, I don't particularly like sewing the chain stitch binding so I started sewing onto raised cords instead, which, I think, is a more suitable binding for various reasons. And the raised cords look really cool. The book shown here with the really dark brown cover is made from wooden boards given to me by Simon over at Paper Curious when we swapped a while back and I'm keeping that one. The others are made with wooden covers that my Dad prepared for me, thanks Dad! He made them using a variety of hardwoods: teak, oak, cherry, and maple. Those are available on Etsy. Very interesting about the opening action. 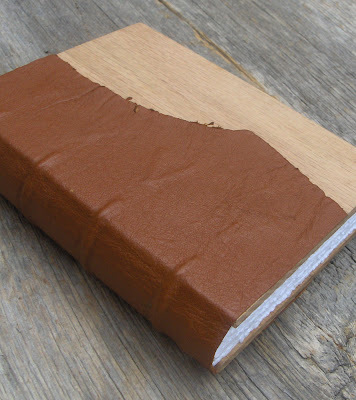 Love your books with the wooden covers. I like to use textiles on the covers - outside and inside - and put a few matching coloured pages around every signature to get the book 'together'. Thanks Rhonda for explaining that and for taking the time to make the little video clips which made it ever so clear. i will be thinking about that a bit more the next time I bind some coptic style books. Excellent demonstration Rhonda. I've been adding coptic headbands to my coptic bindings to help give that added cohesiveness but my favourite form of sewing is onto laced-in cords, either leaving the spine open, or covered. I quite like coptics and they are certainly quick and easy if you need to produce a book in a hurry but I feel they are not a strong enough binding for many of the uses they are being sold for. For instance, I have very little faith in the coptic photo album once the weight of the photos is added to the structure. One of my favourite subjects, perhaps I should blog about it. Thanks Merry, Paperfection, Hilary, and Carol! I agree, Carol. I don't think exposed spine chain stitch bindings are suitable for photo albums. I've tried adding the headbands as well, and it helps, but still it isn't always enough. 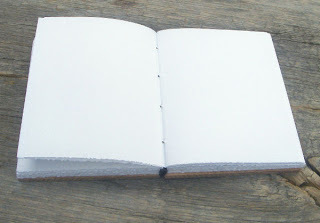 I think an unsupported sewing should only be used for small, lightweight books with just a few sections. More than 6 or 7 sections and the book doesn't hold its shape very well at all. There are better exposed spine bindings - which still allow the spine to be decorated with decorative paper wrappers on the sections and such - but are stronger overall. Raised cords, like you mentioned or leather thong sewing supports or even the buttonhole binding. The prevalence of this naive conception of democracy allows us to be hoodwinked by our ruling elites into supporting an agenda that serves the interest of the global oligarchy while pretending to be radically democratic or populist.